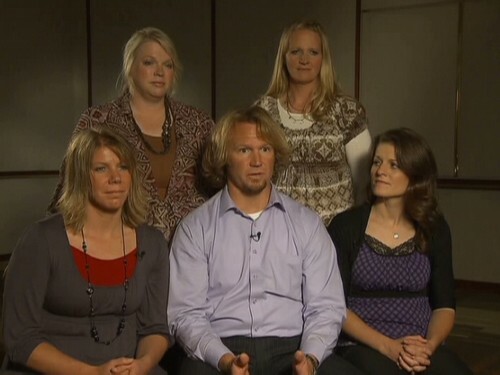 TLC’s reality show SISTER WIVES returns tonight with its sixth episode of season five. Tonight’s episode is called, “Four Wives in Two RVs” and on tonight’s show The Browns hit the road for their Spring Break trip along historic Route 66 to meet up with a non-Mormon polygamist family in Missouri. On the last episode, we checked in with some of the Brown teens to see how they were dealing with dating, college, and the uncertainties of their futures as potential polygamists. Meanwhile, Janelle had a battle of her own when she hit a plateau on her weight loss journey. Did you watch the last episode? If you missed it we have a full and detailed recap, right here for you. On tonight’s episode the Browns take a road trip for Spring Break on Route 66 to Missouri to visit a non-Mormon polygamist clan, but cramped quarters in two RVs create tension among the traveling companions. We will be covering Sister Wives tonight at 9:30 PM EST so don’t forget to come back to this site for our full and detailed recap. Make sure to refresh often to get the most recent details. While you wait for the recap, let us know how excited you are about the new season of Sister Wives. Our favorite patriarch is taking his family on a road trip and while it would be nice if his life was a Disney movie with a happy ending included – the reality of taking four wives and having way too many adolescents in one place can only mean trouble. Is Kody going to regret all of this? In order to a meet a biblical polygamous family, Kody is dragging the Brown family across country. Sadly, it’s only the young and the gullible that are excited about this trip. Even the sister wives face the long hours on the road with trepidation. They’ve been down this road before and in all honesty it didn’t work out so well. At the time Robyn refused to ever go back on a RV ever again. Yet here she is breaking her word. And the family really shouldn’t be taking a vacation right now. Never mind the headache waiting to happen. Truthfully, they have some pressing concerns to deal with at home. Their business, Sister Wives’ Closet, is suffering a setback. The money they were waiting on has yet to show up and the adults don’t know what that means for them. The investors said had “yes” after their meeting and so if they haven’t sent the money does that mean their “yes” turned into a “no”? It’s all pretty confusing and Kody’s friend among the investors isn’t offering them any advice. Without the money, they’re approximately 4 weeks behind schedule for the expansion they were planning which leads to the next question – should they try to find new investors? At the moment, Kody thinks they should go ahead with their plans without investors but how long can that really last because it’s not like they didn’t have a reason to seek out investment in the first place. Their main problem with their company is that they have the traffic and just can’t meet the demand with the limited supplies they have now. So everyday the investors don’t come through they lose money! As for the trip, none of them have ever met a biblical polygamous family before; they’ve only ever come across those attached to the fundamental church. And though the trip may not be worth it – the family are serious about enjoying the road trip. They love “The Eagles” so they stopped by one of the places they named in their song. The kids didn’t get the significance though they kept up the happy mood. After all they warned at the start of the trip to be on their best behavior. If they walk around with a sour mood then their younger siblings will imitate them thereby ruining the trip for everyone. And Trudi turned 4 on the trip. She was slightly indifferent about her birthday but her parents were happy. It’s a rare treat when they get to celebrate a birthday in a restaurant because that meant they didn’t have to clean up afterwards. Although Kody did lose his temper on the trip. They had stopped for the night and found themselves in a snow storm. So Kody had to check on the sewage system and imagine his surprise when he found out in the worst way possible that drain was attached properly. Sewage came pouring out everywhere. That was disgusting! Kody couldn’t even control his temper because some of it had splashed way too close to him. Later on though he managed to get over the sewage problem. When they were on the road they heard about a steak contest. And seeing as the family loves to be daring – Kody and a few of the older kids entered a contest to eat this gigantic steak in a hour or less. But their eyes were far too big for their stomachs. No one won that contest which means Kody had to pay 72 dollars on each on unfinished steak – what’s 5 X 72? Yes, no one completed contest yet the kids still enjoyed themselves. They were at ease with each other as well so their parents were hoping the kids would keep up that attitude. However cabin fever did set in and one of the boys lost his lid. His parents had to rein him in and even his older brother was prepared to do the same when the boy was ignoring their warnings. Besides the offence wasn’t that big of a deal. Sometimes prepubescent boys don’t know how to talk to girls and that includes their sisters. Garrison told his sister to shut up during prayer and then tried to get out of apologizing to her for it. And that led to Kody playing hardball with him. He told them they had to treat each other with respect and he’s not afraid to back up that lesson when he hands too.